While visiting Craftgawker recently, my eye was drawn to a clever diamond ring made of paper. The link took me to Dreamy Posy, a paper crafting site started by blogger and video content creator Anh. Not only are her photos gorgeous, but her videos are brief, detailed, and a joy to watch. Believe it or not, Anh is new to paper crafts... the quality of her work tells me she's a natural! "As I live in the East and don't know what Western people think or which seasonal crafts are suitable to make at this time, I make with my own inspiration." I asked her to share a tutorial here as a way of introducing her website and YouTube channel. 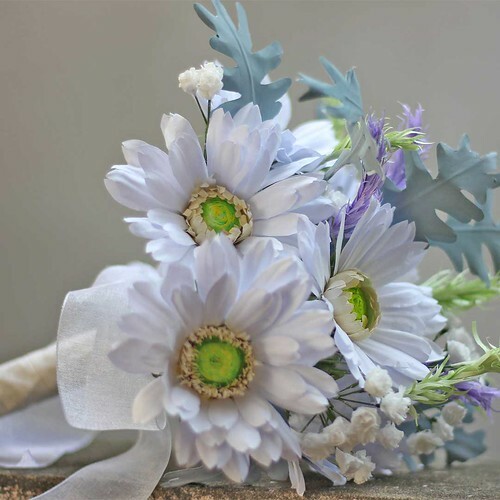 Luckily for us, she agreed right away and designed this free-form bouquet of paper gerbera daisies, dusty miller and baby's breath, just right for a rustic wedding. The subtle colors and dusty miller foliage are perfectly on trend this summer. I can't get over how real it looks, especially knowing she mainly used printer paper and ordinary tissues. 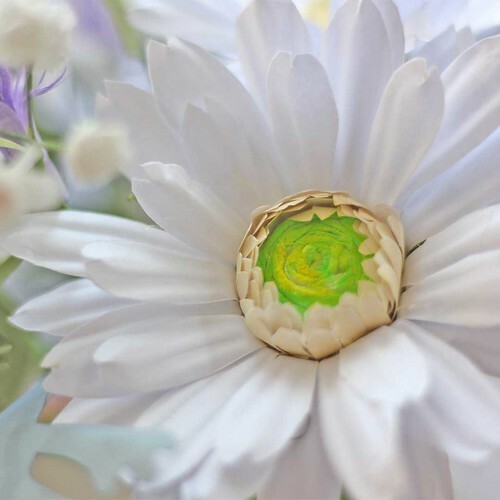 Via the video, you'll learn her ingenious method for shaping authentic petals. 3 Insert a 24 gauge stem wire inside the rolled center and slip on the straw. 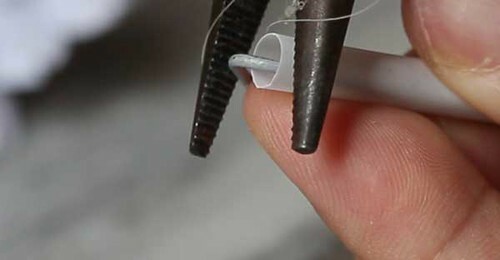 Apply hot glue to the base of the center to secure. Bend up the far end of the wire outside the straw. Assemble flowers and foliage into a casual bouquet. Wrap the stems with ribbon, turning the end under, and glue it in place. Visit DreamyPosy on YouTube to see more paper craft tutorials. Anh is also on Instagram, Facebook, Twitter, and Pinterest. Thanks so much, Ann, not only for accepting my guest post, but also a great teacher for a newbie like me to all of these. I have learnt a lot from you. Thank you for sharing this wonderful site! I am now following Ahn on YouTube. One of the reasons I love your blog is because you are so generous in sharing others' creations. Anh, you are very welcome! I look forward to seeing your future creations and wish you much success with your site and videos. Aw thanks Traci, that's so nice of you to say. Anon, thanks for taking the time to comment. I'm glad you like the post. 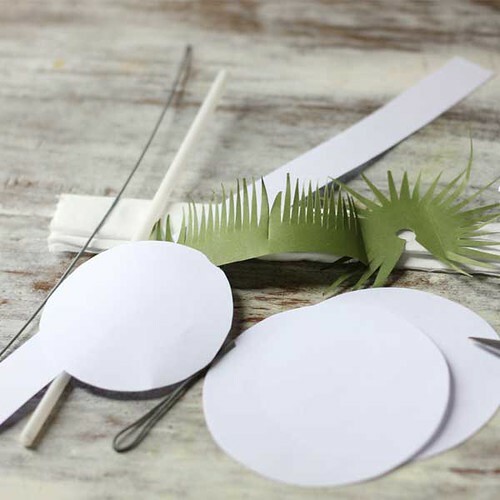 Thank you so much for the blog recommended, it is so gracious to know other talents who are so dedicated to paper crafts and their generous tutorials. You're welcome, Edna! I'm glad you enjoyed Anh's tutorial.